A whole house filter connects to the main water line entering your house so that all of the water dispensers in your house – faucets, toilets, showers, baths, kitchen, laundry – dispense treated water. Typically the whole house water filter is connected to the main water line before it splits into the hot water heater. Customers wishing to purify the water to their garden and sprinkler systems may find this to be a bit more challenging as the main water line coming off the city system often splits off into a "house" water line and a "yard" water line in the house's foundation slab or at the street level before the house. Consult your home's blueprint or city water utility for further details. This will depend on what types of contaminants are in your water. Determine what you need to remove from the water. If you are on a municipal city water supply the typical contaminants of concern are chlorine and chemicals, sediment and hardness minerals. The types of contaminants typically found in a private well water supply are sediment, iron and hardness minerals, but can vary from nuisance contaminants to toxic or damaging. If you have a private well, please send us a copy of your most recent water analysis or get your well water tested so we can make a recommendation based upon the contaminants that are actually in your well water. Upon request most municipal water utilities will provide you with a water analysis. For more information on Well water and water testing please read our free Water Testing Guide and Well Water Information Supplemental. Water Softeners remove hardness minerals specifically, whereas water filters are designed to remove a broader range of contaminants. However they can be combined in one unit referred to as a water conditioner such as the SP3 Scale Prevention System with Filtration. Learn more about Water Softeners and Water Conditioners here. Sediment – typically refers to visible particles in the water, which need to be mechanically strained out such as dirt, dust, rust and sand. Water supplies with high amounts of sediment should consider multiple stages of sediment filtration, with the stages gradually becoming finer. Reusable filters should also be strongly considered. Water supplies with less sediment can use disposable, finer filters. Chart showing different contaminants and their size. Chemicals – most chemical contaminants can be removed using carbon filtration. The most common chemical disinfectant found in municipal city water supplies is chlorine, which can be removed with a carbon filter. List of chemicals carbon can remove. Iron – there are 2 types of iron found in water supplies, ferrous (aka dissolved or clear water iron) and ferric (aka rust or red water iron). Red water iron and rust particles can be removed with a sediment filter, whereas clear water iron can be removed via oxidation or ion exchange. Factors affecting the life of an oxidizing filter are pH and the presence of Hydrogen Sulfide. More information on contaminants and water treatment methods. Flow rate – measured in gallons per minute (GPM), flow rate determines the amount of water available to run your shower, toilet, hot water heater, dishwasher, etc. When calculating your requirements look at the demand ratings printed on your appliances and toilet. Typical showerheads flow 2.5 to 5 gpm, toilet 5 gpm, dishwasher 3 gpm. Depending on the size of your house and family your water flow rate requirements may range from 15 - 40 gpm. A whole house filter system with a flow rate less than 10gpm is unacceptable for maintaining uninterrupted, comfortable water pressure during peak use. Filter size – the larger the filter the longer the service interval, and the more water it will flow and with greater pressure. However port size has a greater impact on GPM and pressure. The ideal filter size for most homes is 4.5" x 20", however large homes may require the 25 gpm flow rate and 1 1/2" ports found in the largest Nelsen SP3 system. 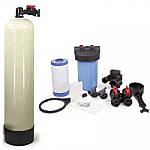 Filter life – sediment filter life will vary depending on the sediment quantity and quality. Good quality whole house 4.5" x 20" carbon filter cartridges will last 100,000 – 150,000 gallons in normal municipal water supplies. Stand-alone carbon filters with carbon beds, as opposed to carbon filter cartridges, will last much longer ONLY if they have a backwashing valve and a regular back wash cycle. Port size – the ideal port size on a whole house water filter is 1". Even if the home uses ¾" piping, using a 1" ported system will not create any bottlenecks when fitted onto the ¾" pipe. Whole house water filter systems with 1" ports and 4.5" x 20" filter carry more than enough water so that pressure drops are virtually non-existent. Read our Water Testing Guide here.